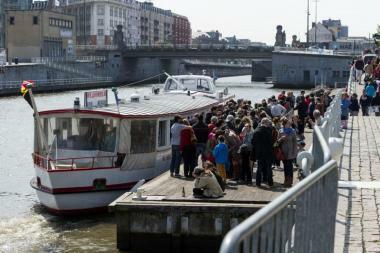 2013-06-10 – On Tuesdays, Fridays and Saturdays throughout July and August, Brusselsby Water is running aperitif cruises from 7.30to 9.30 pm. The cruises are a way of relaxing while discovering the city from the water. Guests are greeted by the crew with a free aperitif. A guide explains the sights and is on hand throughout the cruise to answer questions. The guests discover Brusselsvia its waterway, Vilvorde and its new Watersite project, Grimbergen and the Green Belt, with accompanying music. These summer cruises cost €10 per person, including aperitif. A meal on board can be booked. The boat is also available for groups for private hire for €500.